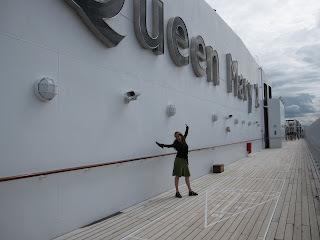 So, I did a transatlantic crossing aboard the QM2 last week, but the highlight wasn’t the food…or the nightly balls…or even the hot tub under the stars. In fact, the highlight of taking a ship to England didn’t happen on board at all. Alas, I got seasick, caught the flu, then ended up quarantined in my room and relegated to sipping broth, so the real highlight was, uhm, getting off – boy, was I glad to – and searching out some good cheese on my sad little sea legs. 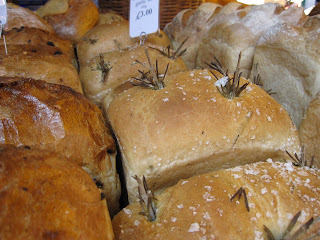 Thank goodness for London’s Borough Market on the south bank of the Thames. This Saturday I was there, on firm ground, eating my first bite of solid food in a week: a heavenly Halloumi veggie burger that was, quite possibly, the best veggie burger I’ve ever eaten. Who knew Halloumi -- that soft, grillable cheese – could taste so good minced up with mint and zucchini and carrot, then sandwiched in a bun, and served up by a grinning Rastafarian? Bliss. 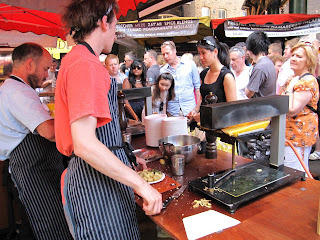 Here was more bliss: a few photos from this age old market, where you can find wheels of Stichelton piled on high, samples of beautiful Comte, and, lo, dear friends who love a melty meal…halves of Swiss Raclette toasting over hot irons manned by beautiful cheesemongers who scraped the goo over steaming new potatoes garnished with cornichons. What a thing of beauty! What a small price to pay (braving sharks, bracing my arms against a rocking ocean liner, holing up in a windowless cabin) for pleasure! I’d do it all again if this mariner could end her wave-tossed week with a paper plate of stinky Raclette waiting at the dock. Next time I travel the ocean, I’m going to take a Halloumi air mattress. And a lot more digestive biscuits. And some Imodium. P.S. Should you find your cheese-loving self in London this summer, do your whole body a favor and make like a banshee for the Borough Market (it's just a mozza toss from the Tate Mod). Wander through the gleeful masses, buy some cheese, sample a homemade sausage, and marvel at the twentysomething culinarians who are creating a food community like no other. Then, sit on the ground outside the Southwark Cathedral and drool over everyone else's food. And iced coffee. And berries with unpasteurized creme. Who needs a lot of fancy teak decking when you can have so much luv on shore? For the last two months, I’ve been eating as many kinds of blue cheese as possible. No, no, this is not some culinary form of Fear Factor. I just happen to love strong cheese, and one day I realized that, for as much time as I spend lurking about cheese counters, I don’t actually know all that much about my favorite food. Being a former Wisconsinite – and, at one time, a food writer for Isthmus Newspaper – I decided it was time to teach myself about the secret life of cheese, and I began to look for a guide. 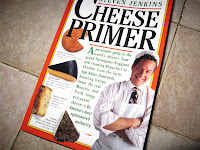 Lo, I came upon The Cheese Primer, by Steven Jenkins, the original cheesemonger of New York’s Dean & Deluca. Here I learned about the 8 types of cheese – fresh, bloomy, washed-rind, natural-rind, uncooked/pressed, cooked/pressed, processed, blue-veined – and a natural order came to me. I would go crumb by crumb, curd by curd, through them all, beginning with the strongest. Why? I’m a strong-headed grrrl, and I’ve always liked strong cheese, the stinkier the better. This blog is my written record of nibbling. And learning. 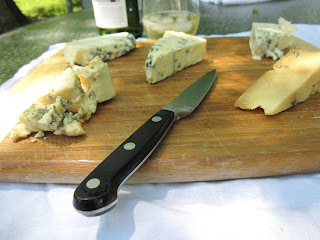 So far, my blue cheese summer has taken me – well, my tongue – all over the world. I’ve been amazed to discover how many countries take pride in a sharp, veiny blue. The French have their Roquefort, the Italians their Gorgonzola, the Danes their Saga. 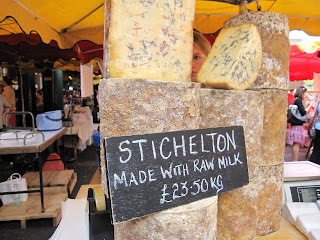 The Brits make a proper Stilton, which is much milder and subtler, and even the Irish have a creamy Cashel from County Tipperary. The strongest sample so far came from Spain, a wedge of Cabrales that set my tongue on fire. 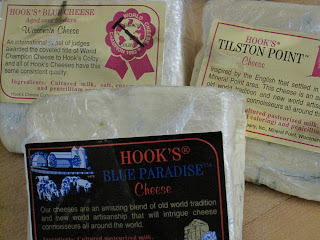 Naturally, I visited Wisconsin recently to sniff out some blues, and wasn’t I surprised to find an artisanal blue wonderland?! Everyone in Madison talks about Hook’s, which produces five different blues (a deep bow toward Mineral Point), but there are many more blues giving off gorgeously whiffy fumes in other parts of the state. In fact, I’m wondering if Wisconsin produces more domestic blues than anywhere else. 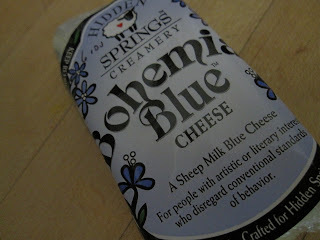 One of the most interesting blues I picked up at the Madison Farmers’ Market was Bohemian Blue, from Hidden Springs Creamery, a bright, crumbly dream made from sheep’s milk. Think of feta, then add sharper flavor and blue veins. I liked the sweet, slightly sour finish of this medium-bold, clean-tasting cheese. Crumbled on a salad, served alongside grilled lamb, Bohemia would induce bliss. I can almost taste it crumbled on slices of still-warm-from-the-garden tomatoes. Brenda Jensen, who owns and runs Hidden Springs near Westby, is something of a dairy wunderkind. Her first entry in the U.S. 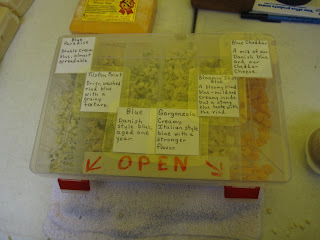 Cheese Championships won a gold medal – check out her “Driftless” cheese. Jensen’s only been at it for four years, and already she’s making remarkable stuff. What’s her secret? She raises the same sheep breed that the French use in making Roquefort. Aha! To learn more, check out the great profile that ran in the Westby Times last month, and for heaven’s sake, pick up some Hidden Springs Bohemian Blue. Unfortunately, that may mean driving to Westby or reserving a table at Madison’s much-lauded L’Etoile, a James Beard Award winner. Surely, you can also snag a few crumbles by mail from Hidden Springs' web site. My goal this summer has been to eat as many blue cheeses as possible, and yet, when I found myself in Madison, Wisconsin this past week, I had to break with tradition. Yes, yes, I ate my share of blue – along with plenty of gooey grilled cheese sandwiches, some delicious bandaged cheddar, and even a wheel of something runny smuggled in from France. (I can’t go into detail, and if questioned, I will confess I ate it mostly in the dark, distracted by spit-roasting birds and too much good wine.) Alas, the real reason I return to Madison in the summers is to eat a puck of Anne Topham’s ephemeral goat cheese rolled in ash. 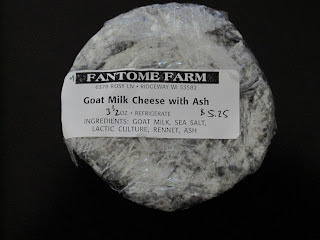 Fantome Farm has been a staple at the Madison Farmers’ Market for as long as I can remember, and whenever I go, I am guilty of buying Anne Topham’s fresh chevre and peeling back the plastic wrap to eat it on the spot as if it were candy. In fact, my brother and I call this cheese “Peppermint Patty” when we speak in code, which is more often than you might think. Sometimes we split a round, passing it back and forth, as we peruse the market stalls, oogling flowers and jams, enjoying a kind of amniotic silence. This is the first goat cheese that made me LOVE goat cheese. It predates my love affair with blues. Years ago, it was this cheese that made me aware of “artisanal cheese,” which is to say that Anne Topham is, to me, a kind of Cheese Mother. I love the clean, crisp taste of this chevre -- its smooth, mild taste makes me think of spring. Its ashy appearance and trillium-colored inside brings to mind a forest floor, alive with pale wildflowers. The characteristic sourness that comes with goat cheese is very gentle here – this is a good petting-zoo cheese for people who are new to chevre – and the ash, although startlingly black, is mostly tasteless. It adds a faint salty edge. Anne Topham and her partner Judy Boree have been making French-style goat cheese for over 20 years, beginning with a goat named Angie and her kid, Gilda Radner. I’d like to think those goats would be proud to know they’ve spawned a Wisconsin delicacy. 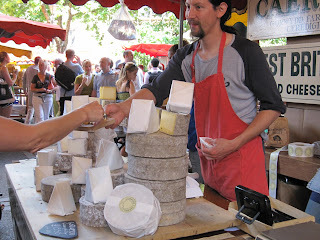 For me, spring is never officially here until I sink my teeth into a round of goat cheese liberally rolled in ash. When possible, I like to eat it while lying in the grass, eyes closed, the sound of market chatter mixing with birdcall over the Capital. It’s also good on toasted rounds of baguette.